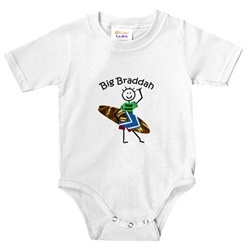 Add any name to this Hawaiian Baby Onesie! 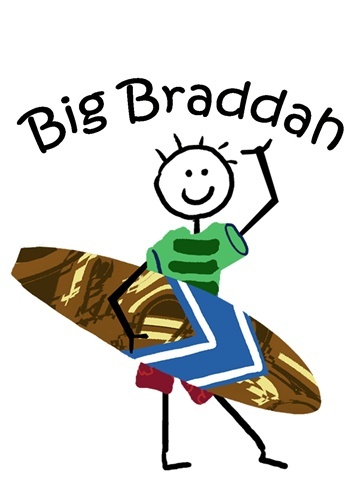 Big Braddah - Showing the Family Some Aloha! Big and Little brother Hawaiian baby onesies! - A Dean Miller exclusive design. This fun beach baby surfing infant bodysuit will keep your Hawaiian baby looking great for any playdate. Hawaiian and beach babies love creepin', crawlin' and sleepin' in our super comfy, 100% cotton jersey knit Infant Creeper. Infant clothes shouldn't be hard to change, so our three-snap bottom helps ease those nasty diaper changes. Great Hawaiian baby stuff for your special little one. 5.5oz 100% cotton, three bottom snaps, standard T-shirt neck. 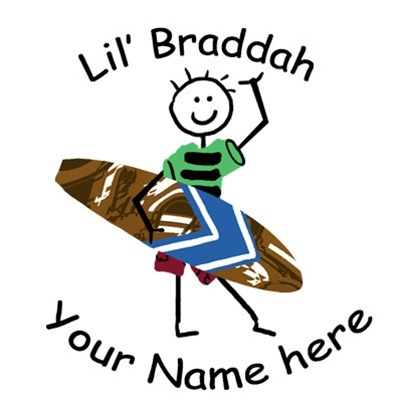 Available to say either "Big Braddah" or "Lil' Braddah"
Can be personalized with any name you like! Makes a GREAT GIFT!! 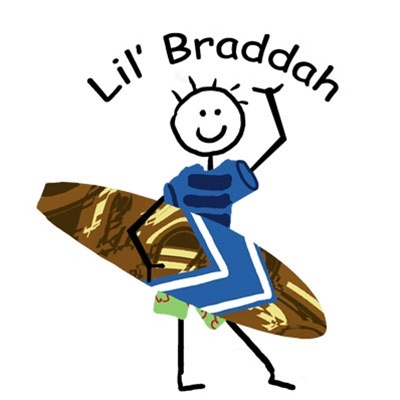 Click on the image of the Hawaiian baby onesie for a larger view or scroll your mouse over the design, and remember you can always call us at (949) 370 - 6535 with any questions you have or chat online with one of our Hawaiian baby bedding experts! Infant Bodysuits are $34.99 each and in stock ready to ship. Thanks so much for checking on our order. It's great to find a company that actually has fabulous customer service.